of a tax has been gaining traction among economists as an efficient, market-based strategy for reducing GHG emissions in the United States. More recently, the idea has garnered the attention of prominent Republicans and Democrats within and outside of Congress as well as advocates on the left and right poles of the national political spectrum. Regardless of the motivation for pursuing a carbon tax, current and future discussions can benefit from an up-to-date and comprehensive assessment of what such a policy would mean for the US energy system and resulting GHG emissions in the future. NEMS, which is a version of the National Energy Modeling System (NEMS) maintained by the Rhodium Group. NEMS is developed and used by the Energy Information Administration (EIA) to produce its Annual Energy Outlook and relied on by Congress to assess the impact of past energy and climate legislation. This paper seeks to answer key questions about the impacts of a carbon tax in the United States. First, how responsive are different sectors of the US economy to a carbon tax at different tax rates? The answer has important policy implications, such as the amount of federal revenue collected under any given tax rate, the likelihood of achieving specified GHG reduction targets, and the potential role of other emission reducing policies. Second, what changes in energy prices, production, and consumption occur under different tax rates? These questions are addressed by assessing three carbon tax rate scenarios. 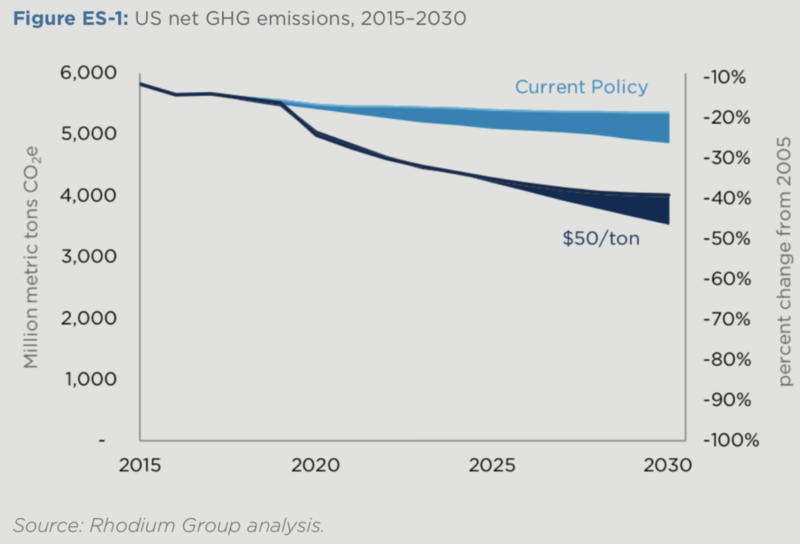 ● A carbon tax can drive substantial reductions in US GHG emissions in the near and medium term. In our analysis, an economy-wide carbon tax set at $50/ton in 2020 and rising at a real rate of 2 percent achieves emission reductions of 39 to 47 percent below 2005 levels by 2030 (Figure ES1). ● Emission reductions primarily occur in the electric power sector. The sector is the most responsive to a carbon price, and, in turn, this is where most economy-wide emission reductions occur. The presence of readily available low carbon substitutes drive emission reductions of 23 to 67 percent in the $50/ton scenario relative to emissions under current policy in 2030. ● A carbon tax drives large increases in renewable energy production and large declines in coal production. Zero-emitting renewable energy makes up 29 to 41 percent of total US electric power generation in 2030, depending on the tax rate scenario, which represents a two- to threefold increase from 2015 levels. Renewables fall in behind coal generation, which declines substantially in all scenarios. The carbon tax drives a 28 to 84 percent reduction in US coal production by 2030 compared to current policy. ● Average per capita energy expenditures rise under a carbon tax but do not reach the (inflation adjusted) high levels seen in recent history, even in the highest tax rate scenario. Increases in energy expenditures per capita due to a carbon tax range from 7 to 27 percent relative to current policy in 2030. Meanwhile, per capita energy expenditures during the commodities boom in the run-up to the great recession were even higher. ● Carbon tax revenue could potentially be large, ranging from $617 million to as much as $2.5 trillion over the first 10 years, depending on the tax rate and technological innovation in the US economy. Decisions over revenue of this magnitude could be contentious. Revenue could be directed to a variety of productive uses, including cutting other taxes, de cit reduction or rebates to individuals. ● Beyond 2030, a carbon tax at the levels considered in this analysis may not be not sufficient for achieving emissions targets. In the long term, the range of tax rates considered in this analysis will likely be insufficient to reduce US GHG emissions 80 percent below 2005 levels by 2050, absent complementary GHG policies, significant improvements in technologies that can act as direct substitutes for fossil fuels, and/or significantly faster electrification of the transportation, buildings, and industrial sectors than we considered in this analysis. While this paper focuses on the emissions and energy system impacts of a carbon tax in the United States, the results are used in separate analyses of the potential distributional and macroeconomic impacts of a carbon tax, which are also part of the CGEP Carbon Tax Research Initiative series.